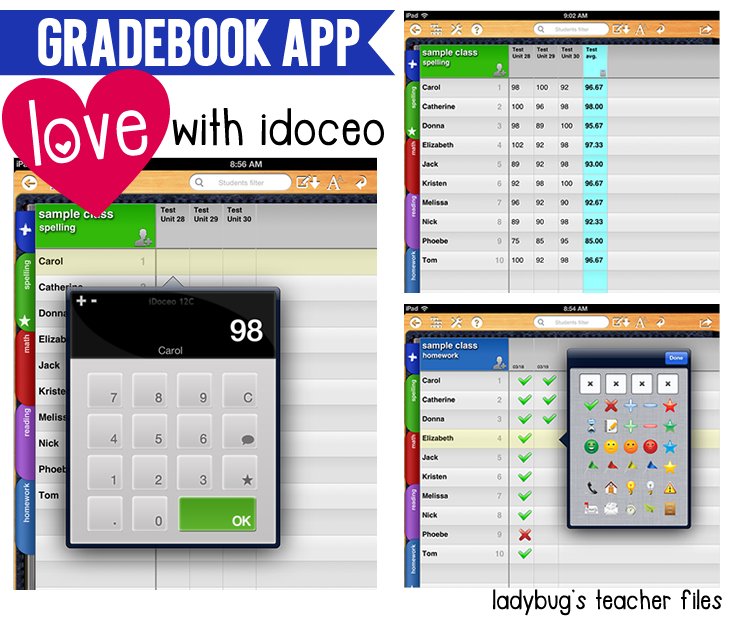 But when I went on a search for a great gradebook app and read about iDoceo, I decided to make the leap and bought my first app! This little app is EXACTLY what I was looking for and then some! Naturally, I couldn’t wait to share what I’ve learned with my good friends–all of you! I’m still new to this app and there are tons of features I need to try out…so I’m nowhere near an expert on it. But I did want to share an overview of some incredible features iDoceo offers. Create a class name (mine is “sample class” here, with names of my friends and family). Create tabs for each subject (the class list remains throughout once entered initially). You can color code the subject tabs and move them with ease. The whole setup only took me a few minutes. You can color code anything and everything you’d like! All columns could have a specific color, test columns could be highlighted…there are tons of possibilities. (I like to have a tab just to check off completed homework first thing in the morning). I use this feature to star any students who still need to take a test. Ok, this next part made me hug my iPad. Literally. You can average any and all grades, weighted in any fashion you would like. !!! All you have to do is create a new column and designate it as a Calculation. Choose how you would like it to be graded (I use generic numeric grades to tally my assessments). And you have instant averages! As with the other features, there are tons of choices to keep track of individual students’ progress. You can select assignments and assessments to put on each students’ profile (as shown above). So, as I mentioned above, there are many other incredible features that come with this app and I am still learning about them. And I will say there is a bit of a learning curve to this and it did take me some time to figure out a few parts. However, iDoceo offers customer support and tutorials on their website iDoceo.net and this is a huge help. Oh I owe YOU a big thank you for everything you shared the other day Stephanie! And, oddly enough, it does actually make me want to grade everything!! What a great app! I love how versatile it can be. The color coding did it for me. That and the fact that you can add anecdotal records and notes sold me on this app. I see an "Elizabeth" 🙂 I like her average, too! Thanks for giving us the low-down. This was a wonderful review!!! It is not even that much money. Do you know if you are able to print out "progress reports" to send home?? Thanks so much for making this so thorough and pretty!! thanks Carmen, I'm glad it could be of help! I'm still smiling over it as I organize for our final trimester!! Pretty cool! Your district doesn't provide you with online grading already? We have a program called ProgressBook where we input all attendance,grades, progress reports, and report cards. I don't really love the program but the district requires we use it. This looks way easier to use and more organized! Love how it is colored coded and how you can use it on your iPad to check homework! Do you use an online program through your district to report your grades such as progressbook? Just curious if you were going to do both. We enter our grades digitally for report cards, but we don't currently have a system to track our grades. I don't think I would do both otherwise. This is way better for me 'cause until I found this I was recording on paper. I have searched the app store and it says none found. Is it called something else? We too have electronic grading and we can pull up reports through it. If I didn't have it, I would SO use this. I do love the homework feature. I will have to look into if it can be synced. This is really great! Have you found a planbook that you happen to use on the ipad? That's a big one that my teammate and I just can't seem to find one that we really like. Thanks for the info today! OMG!! This is a most awesome looking app!! I bow down to you for finding it and sharing it!! I'm SO going to buy it NOW!! Thank you, thank you, thank you, Kristen! Hey Jamie, thanks! I really do love it!! I have all of my test and quiz columns set up for trimester 3 right now–I'm so excited! We have been piloting PowerSchool (only about 8 of our schools are on the pilot) but it's buggy right now. This app looks so amazing! I'm going to have to give it a try! Thanks for stopping by Raye! I will have to look into PowerSchool, I haven't heard about it before. At our school we use Edmodo, which is a free resource for your computer and ipad, phone, etc. It has a gradebook. We also set it up so the kids have access. They can check their grade/progress for each subject and they have access to folders we set up for links, docs, etc. It's a great resource – and FREE! This app is "APP"solutly fantastic! I e-mailed the link to your post to our technology instructional coach and our entire admin team. Our K-2 is 1:1 with iPads and the rest of the school will be after state testing! Thank you so much for such a detailed review! I am responding very late. Sorry! Then our report cards are run from what we entered. It can be good that parents are kept up to speed but not so much when they want grades entered daily (which isn't going to happen). I like this idea for tracking homework and stuff though! As always, thanks for sharing! I downloaded this about a month ago, then my iPad was stolen. When I received my new one, I reloaded and started inputting information. We have an online grading system too, but I LOVE this app! It allows me to enter homework grades and immediately send emails to parents if the student did not complete their assignment. I can then later enter grades online for the week, versus individually. I usually give 5 points for homework completed on-time, 3 points if partially completed, and 0 points if nothing was completed. The immediate feedback helps me stay on-top of students without added work after school or during prep. I usually type one message, copy it, then I can paste into assignment notes for other students with little time/effort. I learned some things from your post! Thank you! ok–I bought this last night and blame you for the fact that I went to bed so late getting it set up 😉 I can't wait to try it. What sold me over other similar apps is of course your recommendation, but also the fact that you can annotate with photos, video and audio. I've been doing that on Evernote, but it's becoming a hot mess. I love that I can make a separate class for a book club, then record their conversation instead of scribing it, then make plans for them based on that. I also love that I can take a quick picture of a student's work if I want to read it later, vs. carrying their notebook home. Love, love. Oh, and the seating chart? So cool. When I want to move their desks I have a hard time visualizing, and this can really help. Thank you again! I love love love this app!!! I found it a few days ago and I've been playing around with it. I also love my ipad mini! I've had it for a couple weeks and I agree, I don't know how I ever taught with out it. If there were ever a reason to buy an iPad – this is it! After reading your blog post, I researched this app. It looks great and the posts above mine seem to be more reasons to buy that iPad and the Doceo app. Thanks for reporting on this! Congratulations on a massive milestone. Wow! What a great resource! I have been using LearnBoost which is an online gradebook and I really enjoyed it, though I did have to do some modifying because my school grades on a scale of 1-4, not letter grades. I had to play around with it, but it was pretty successful. I'm excited to check out this app though!